This charmingly renovated cottage forms the annexe to a beautiful, 18th century family home situated just a couple of minutes walk from the pretty pebble beach and high street of the attractive seaside town of Budleigh Salterton. The cottage sleeps four and is ideally suited to a couple or small family. The front door leads into an open plan kitchen/sitting room with fully equipped modern kitchen and pine table with seating for four. The sitting area has a two seater sofa and two comfortable wicker chairs, a flat screen TV and DVD player and a French style wood burner. Stone stairs lead to an pretty double bedroom offering glimpses of the sea from the window seat. The smaller children's room has a single bunk bed and plenty of space for a travel cot. There is a private, south facing courtyard and patio garden with outdoor furniture where you can eat outside and have BBQs. French windows lead out from the sitting room area. My husband and I own Lyndale and live here with our three small boys. We are all into the outdoors and sports which is why we love this area of East Devon so much. We all enjoy dinghy sailing on the Exe, cycling both on and off road along the coast, Woodbury Common and Dartmoor. The boys play cricket at the local club and go to school in the town and I get out into the lanes or along the coast paths for a run when I can! We fell in love with Lyndale when we were looking to move in spring 2010 and couldn't believe our luck when we moved in a few months later. There is a lovely balance of town and rural living here which suits us and our children. The City of Exeter offers what we need in terms of culture, shopping and work life; you can be on a remote part of Dartmoor within an hour; the numerous tourist attractions keep our family and friends well entertained and we never get bored of being right next to the sea. The family bathroom is white and modern with a bath and shower. The sitting area has a two seater sofa and two comfortable wicker chairs, a flat screen TV and DVD player and a French style wood burner. A digital radio, books, DVDs, children's toys and WIFI are all available. East Devon Golf Club is situated on the cliff top above Budleigh Salterton and is regarded by many as one of the finest courses in the South West. Outside: There is a private, south facing courtyard and patio garden with outdoor furniture where you can eat outside and have BBQs. It is surrounded by shrubs and pots of flowers and accessible from the front door or French windows from the sitting room area. Cleaning / Towels / Linen / Maid service: All towels and linen are included and changed weekly if you are staying for longer. Fuel for the wood burner is provided and a travel cot on request. We also leave a little Devonshire treat on arrival! Everything was clean and lovely. The outside area was beautiful as well. It's right up the road from the high street and beach. The kitchen had all the fixings for delicious cream tea on arrival. Katie was very helpful with everything. Would definitely stay here again and recommend. Cosy, clean and comfortable cottage in a charming town. We really enjoyed our stay in the cottage, which was lovely. Katie was really friendly and helpful when greeting us and suggesting walks and places to eat in this lovely area. We really enjoyed our stay, and would thoroughly recommend to our friends. Enjoyed it very much, the cottage is ideal. This is the second time we have stayed in this lovely cottage. Great to be so near the sea front. Also good to have a small garden for kids to run around in. All facilities provided. Near to an excellent fish and chip restaurant. We've also just discovered Earl's Coffee nearby - my best ever veggie breakfast (also great for kids and non-veggies). We hope to return again soon to this cottage. The best family holiday stay we have had since our children came along. As a family of 4 (2 boys, 4yrs and 1yr) this was not only the perfect location for closeby family days out, but a home from home stay. Katie goes above and beyond to make your stay as comfortable as possible providing lovely cream teas on arrival, fresh coffee, milk and washing facilities (with two boys this was greatly appreciated). The cottage itself has everything you would need and a lovely secure garden. 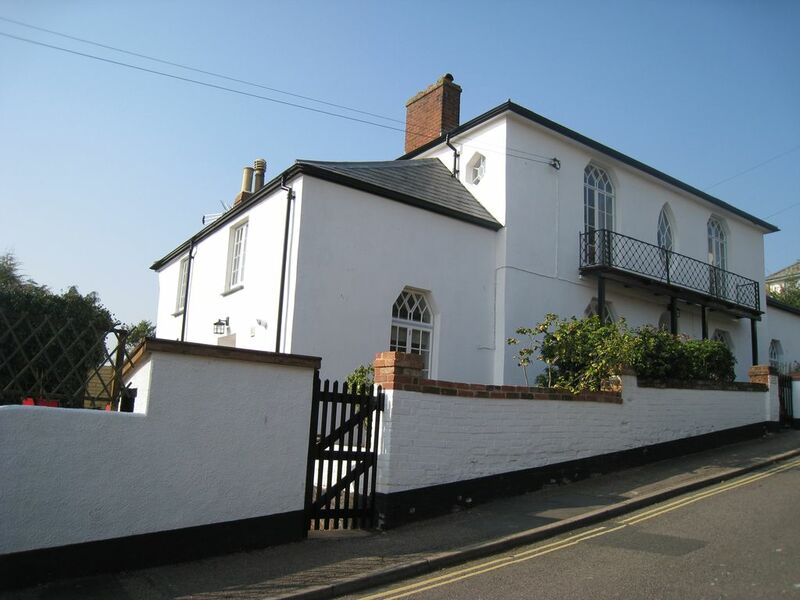 The cottage is a short walking distance to the peaceful beach of Budleigh. The town itself also has some beautiful quaint shops and a co-op for all supplies. It is also close to the sw coastal path, ideal for anyone interested in some breath taking walks or challenging runs!! We will certainly return here in years to come!! We were all very sad to leave and could easily have stayed another week. Thanks for such a lovely review Lindsey, only sorry we missed you this time. We'll make up for it on your next visit! Really well equipped and central to all Budleigh Salterton's lovely restaurants and the beach. Ideal for walking on the coast and really relaxing. Budleigh beach - 2 mins walk - is great for swimming and safe for children who will enjoy the pebbles more than you think. Exmouth beach - 10 mins by car - is a traditional seaside resort for ‘bucket and spade' family fun and plenty of water-sports on offer. Sidmouth beach - 15 mins by car- is the next stop east and has great swimming, sand, pebbles and rock pools. Exeter Airport is about 10 miles away and Bristol Airport is about 75 miles. There are good train links to Exeter either cross country or approx. 2 hours from London Paddington. You can easily have a good week here and get everything you need without a car but are so many places to visit in the area that it is probably recommended to have one. Honiton - 12 miles and famous for lace-making and antiques. Sidmouth - 6 miles to the attractive Regency seaside resort. Branscombe - 12 miles to the attactive National Trust village. Families with young children are well catered for in Budleigh with the beach and play park nearby. Bicton Park Botanical Gardens is lovely and just a few minutes away. Boat trips run from Topsham, Exmouth and Sidmouth. Crealy Adventure Theme Park is fun for kids whilst Powderham Castle is in a beautiful setting beside the Exe estuary. There are zoos in Paignton, Sparkwell (Dartmoor Zoological Park) and Exmoor (Exmoor Zoo). Go Ape! is at Haldon Forest if you are into climbing trees, and sliding across high wires and rather tamer are the Plymouth National Aquarium, Pennywell Farm and the Donkey Sanctuary at Sidmouth (which is free!). The Cathedral City of Exeter has shops, leisure centres, cinemas and lots of restaurant options. Booking Notes: Please call to confirm your booking when we will ask for 30% payment to secure your booking and the balance 6 weeks in advance of your stay. We ask for full payment if you are booking less than 6 weeks in advance. We take a £100 deposit cheque for damages which is returned to you on departure. If you need to cancel at any point, we will do our best to re-let the cottage and will pay you a full refund if we do. Changeover Day: Changeover day is Friday and we ask that you do not arrive before 4pm. Departure time is 11am. This applies to short stays too which run over long weekends Friday - Sunday (3 nights) and Monday - Friday (4 nights). Notes on prices: Low season - November to end of March (ex Christmas) - £400 per week. Mid season - April to May half term and October - £550 per week. High season - May half term to school holidays and September - £650 per week. Peak season - School summer holidays - £750 per week. Short stays - Available for arrival for a 2+ day period - please contact for more details.